Made in England and covered in stunning hand carvings, this antique Victorian bureau bookcase will make a statement in any room! 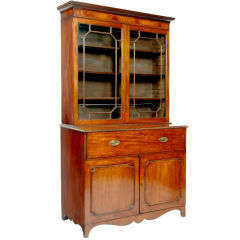 It was originally crafted around the year 1880 from oakwood and remains in very good condition today. 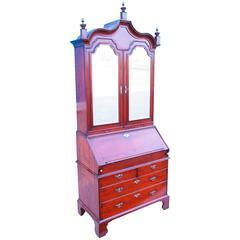 Providing a bookcase section, desk section, and storage cabinet it is a very functional piece of furniture. The most impressive feature of this piece is its hand carvings. 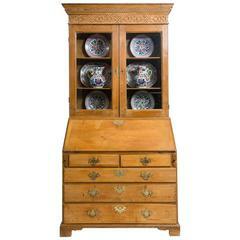 Flora carvings are present through the front of the piece and featured on the lower cabinet doors and the bureau fall. As a matter of fact, the only part of the front that isn’t carved are the fielded panels on the lower doors! Perhaps the most interesting are the carved heads that make up the pulls for the drawer and the pull-out supports for the desk section. They really make this antique Victorian bureau bookcase unique! All of the doors and the desk lock and two keys are included. The locks have been replaced and are not original. The top section has three adjustable shelves. Each shelf front is carved as well. The shelf depth is 7?. The back of the inside of the bookcase has been covered in a wood grain laminate of some kind, but the solid wood panels of the back are present underneath. As you fold down the desk front you will see the inside is fitted with dividers and several small drawers. When open the desk has a usable surface that measures 36" wide and 20.75" deep and is 33" from the floor. Below the desk is a drawer made with hand cut dovetailed joints. It opens and closes easily. Finally the bottom cabinet section is divided in two inside with a removable wooden shelf in each section. This piece has survived the years in very good condition. It has some cosmetic issues that have occurred over time which lend character to the piece. There are minor age separations in the wood on the lower door panels and both sides. These do not affect the structural integrity of the piece. The apron has a small spot of damage in the corner by the right foot. 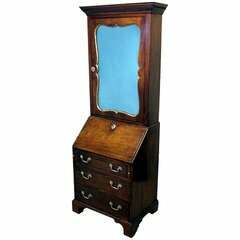 Otherwise this antique Victorian bureau bookcase is in great shape and is a stunning piece of furniture from the 19th century. It does come in two pieces (top and bottom) for easier moving. This item is currently located in Atlanta GA, USA. 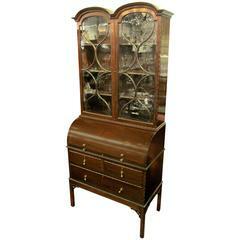 Rare and fine Old English Edwardian period double dome cylinder top inlaid mahogany bureau bookcase. Please note handsome pullout leathered slide and fitted interior.